Our technical know-how, employee's commitment and the spirit for total customer satisfaction has enabled us to produce millions of products every month. Our own Electroplating facilities include Copper, Nickel, Tin-Lead, Lead free Tin, Palladium, Gold and Passivation. We can provide plating in cost effective barrel or jigging for delicate parts. Plating thickness measurement by x-ray, and our own in-house laboratory to perform solution analysis and testing ensure a timely and efficient quality control. The on-site industrial effluent treatment system ensures we do everything we can to provide a clean and environmentally friendly product. 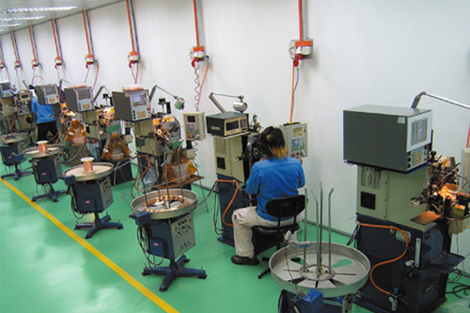 Our production lines are well organized and teamwork has been established throughout the company.